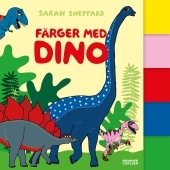 Sarah Sheppard loved dinosaurs make a comeback in a board book about colors for the youngest children. Here we meet the YELLOW Allosaurus, PINK Utahraptor and ... who is it that sneaks into the green jungle? Tyrannosaurus course! There are also facts boxes on each spread.